The film opens by showing a large crowd waiting for Rahul Jaykar (Aditya Roy Kapur) – a successful singer and musician whose career is waning because of his alcohol addiction – to perform at a stage show in Goa. After nearly completing a song, he is unexpectedly interrupted by Aryan (Salil Acharya), who was losing his career due to Rahul's, during his performance. Rahul fights him, stops his performance, and drives to a local bar. He meets Aarohi Keshav Shirke (Shraddha Kapoor), a bar singer who idolises Rahul. After noticing Aarohi looking at a photograph of Lata Mangeshkarin the bar, he assumes that she wants to become a singer. Impressed by her simplicity and voice, Rahul promises to transform her into a singing sensation and asks her to never perform again in bars. Due to his assurance, Aarohi leaves her job and returns to Mumbai with Rahul, who convinces record producer Saigal (Mahesh Thakur) to meet her. 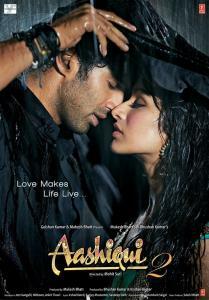 When Aarohi calls Rahul, he is attacked and injured by some thugs, and is unable to receive her call. His friend and manager Vivek (Shaad Randhawa) decides that news of the assault on Rahul should not be leaked to the media, and instead publicises a false story that Rahul has left the country to participate in stage shows. When Aarohi attempts to contact Rahul again, Vivek ignores the calls. After two months of futilely attempting to contact Rahul, a broken Aarohi is forced to sing in bars again because of her family problems.